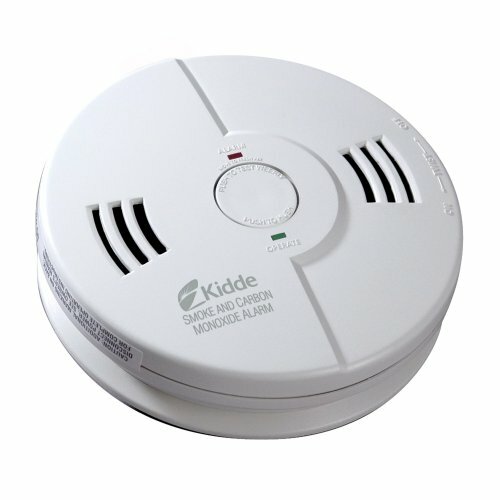 The Kidde KN-COSM-B Battery-Operated Carbon Monoxide and Smoke Alarm combines two important safety devices into a single unit. 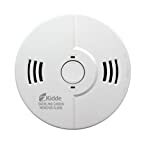 This alarm includes a voice warning system that announces “Fire, Carbon Monoxide, Low Battery, or Smart Hush Activation.” The voice alarm eliminates any confusion and clearly warns you and your family of a smoke or carbon monoxide danger, or if your battery is in need of replacement. This unit uses three AA batteries, protecting you and your family even during a power outage. This alarm uses ionization sensing technology for the smoke alarm. Ionization sensing alarms may detect invisible fire particles (associated with flaming fires) sooner than photoelectric alarms. Photoelectric sensing alarms may detect visible particles (associated with smoldering fires) sooner than ionization alarms. 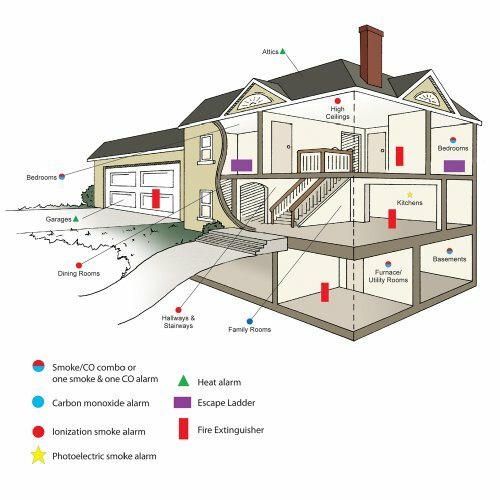 Kidde strongly recommends that both ionization and photoelectric smoke alarms be installed to help insure maximum detection of the various types of fire that can occur within the home. Employs both smoke and carbon monoxide sensors. Stand-alone battery operated alarm is easy to install throughout the home, as no wiring is needed. Features a hush button to silence the alarm for non-emergency situations like a smoky dinner. 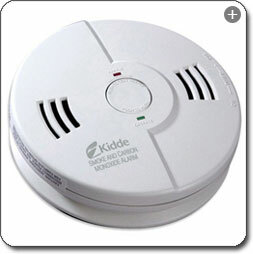 Voice alarm eliminates confusion and clearly warns of smoke/CO danger or low battery. 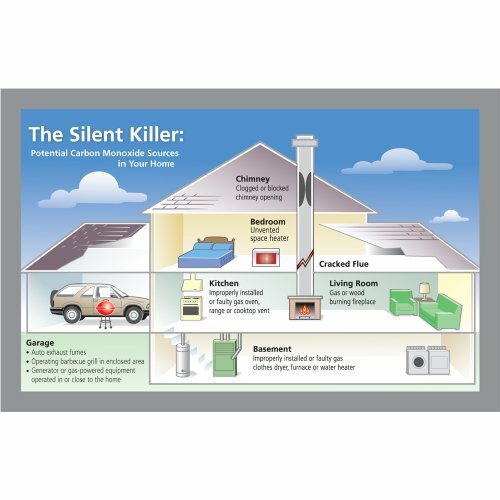 Protects from two different hazards, smoke and carbon monoxide and has a different voice warning for each hazard. View larger. The battery operated KN-COSM-B offers easy installation. View larger. 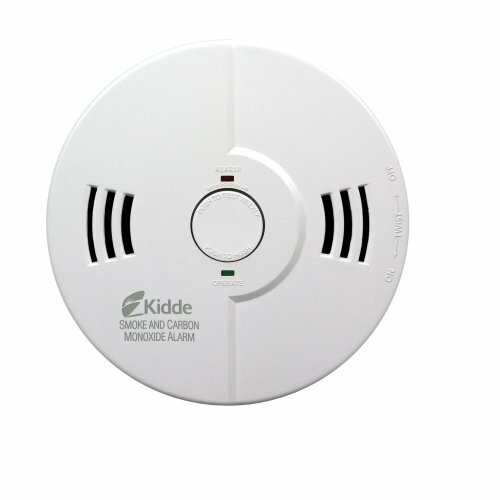 The Kidde Combination Carbon Monoxide & Smoke Alarm includes a voice warning system that eliminates confusion and clearly warns you and your family of a smoke or carbon monoxide (CO) danger, or if your battery is in need of replacement or your alarm is in hush mode. Low Battery: One chirp followed by warning “Low Battery.” The red LED light will flash. This pattern will continue every minute for the first hour. After the first hour, the red LED light will flash once every minute and will be accompanied by the chirp sound. The “Low Battery” warning will only sound once every fifteen minutes. Voice Hush Indication: “Hush Activated” and “Hush Canceled” voice announcement. Peak Level Memory: If the alarm had detected a CO level of 100ppm or higher when the Test/Reset button is pressed, the unit will announce “Carbon Monoxide Previously Detected” to warn of the CO incident. By pressing the Hush button, you can easily and safely silence nuisance alarms caused by non-emergency situations, such as overcooked dinners. This feature desensitizes the alarm for approximately 10 minutes. If the smoke is not too dense, the alarm will silence immediately, the unit will verbally announce “Hush Mode Activated”, and the green LED will flash every 2 seconds for approximately 10 minutes. The battery powered alarm provides continuous protection, even during power outages. Because this alarm only helps protect you if it’s working, this unit features a red LED that flashes every 30 to 40 seconds to indicate that it is operating correctly. For additional peace of mind, the alarm also contains a test/reset button that enables you to periodically test its circuitry and horn. If any form of battery failure is detected the red LED light will flash and the unit will “chirp” one time, followed by the warning message “Low Battery.” This cycle will occur once every minute, and will continue for at least seven days. Seven (7) years after initial power up, this unit will “chirp” every 30 seconds. This is an “operational end of life” feature which will indicate that it is time to replace the alarm. UL 2034, the independent standard applicable to CO alarms, requires CO alarms to have an end of life warning. This requirement went into effect in March 2007, meaning any CO alarm manufactured after April 2007 with a UL listing must have this feature. 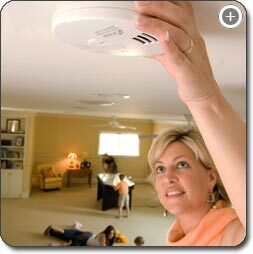 Most states that require CO alarms in residential dwellings mandate that the alarm meet the UL 2034 standard. 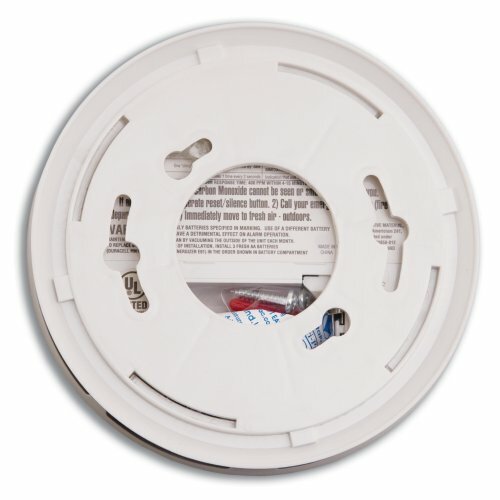 The unit measures just 5.75 inches in diameter and 1.7 inches deep, and it features a neutral, white finish. It includes tamper resist features to deter vandalism or theft. This combination smoke/CO alarm is UL listed, so you can be confident of its quality, and it is backed by a 5-year limited warranty. Renowned for global leadership in fire detection and suppression, Kidde provides solutions ranging from portable fire extinguishers to advanced industrial controls such as flame detection and explosion suppression systems. Kidde is a UTC Fire & Security brand, with a history that’s rich with innovations, from the patent of the Chubb Detector Lock in 1818 to the development of the world’s first wireless networked smoke detectors in 2004. Combination smoke and carbon monoxide alarm with mounting bracket and mounting hardware, three AA batteries, a 5-year limited warranty and a bilingual (English/Spanish) user’s manual.